While browsing online recently, I ran into an article from a couple of years ago from Mother Jones magazine, Is Your Dentist Ripping You Off? The author was commenting on an op-ed she saw in the ADA News about “creative diagnosis,” a term used to describe the practice of peddling unnecessary treatments to patients. If you bring up a topic like this in a group, often you will have someone in the group volunteer a personal story about a dentist they felt was trying to take advantage of them. Just the other day, as I was discussing this point, one person told me about going to a dentist and being told he had 13 cavities. Suspicious, he put off treatment. At his next checkup, a new dentist told him he didn’t have any cavities. Worries of something like this happening are in the back of the mind of most of your prospective patients, and your marketing needs to deal with this reality. So dentists, as a group, are clearly out of touch with understanding what is going on in their patients’ minds. To market effectively, they need to address trust as their first and most prominent issue. Elsewhere in this same book, Suzanne Boswell reports that in her focus groups where she asks patients about the factors they consider in choosing a dentist, a frequent comment is, “I want to go to someone who cares more about me than the money.” But when dentists hire marketers, they find many of those marketers intent on creating aggressive “calls to action” that actually undermine the feeling of trust that is so critical to patient conversion. 1. When your website conveys too much eagerness for the patient to make an appointment, that sends a subconscious signal to your visitor that you care more about the money and makes them wary. We have done studies that have shown that conveying this eagerness will depress phone calls by as much as 30%. 2. When you appear to be bragging, you appear less trustworthy. Douglas Van Praet, in his landmark book on subconscious marketing, Unconscious Branding, talks about how humans are wired with a “BS alarm” that gets activated when someone brags. Many dental websites convey a braggadocious tone by talking in superlatives about the dentist and his or her skills. The tone you want in the wording is a matter-of-fact, professional tone. 3. 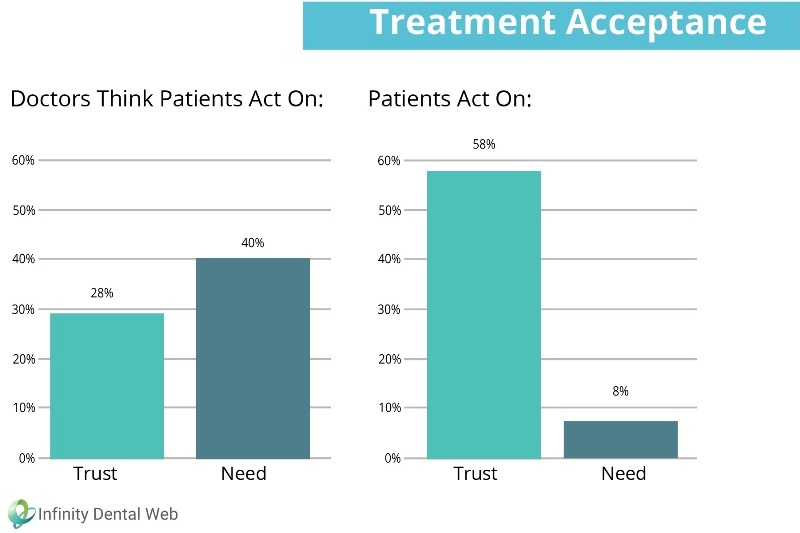 When you try to “sell” treatments, you undermine trust. When you talk about any treatment in only positive terms, as if there are no other options, no side effects, or no disadvantages to any particular course of treatment, that can lead to a feeling that you are not being completely candid with the visitor. It’s better to present both pros and cons when they exist and mention various options to treatment when they are reasonable. Be candid with your patients, be honest in your messaging, and be professional both in your demeanor and in your presentation on your practice website. This is what wins patients—what gets them to call and what keeps them loyal to your practice.